"Vancian" spellcasting isn't particularly my favorite. I've never read any of the Dying Earth books, so I'm probably missing out on something really great. I intend to someday, but I've already got quite a pile on my reading list. I was wondering if there was some way to use the exact system as written in S&W, but apply a different fiction behind the magic. What if, instead of memorizing spells, Wizards where actually more like alchemists who put together potions and oils, and the activated chemical reactions created the spell-like effect. In game terms the spell would be identical as written, but the story and flavor behind it would be a little different. This could open up opportunities for different kinds of adventures and for molding my own campaign into something unique. In the case of some of these I've actually fiddled a bit with the system (particularly spell points, or manna as I'm calling it), but most of these use the system as is with just a different reason behind them. Starting with the classic spellbook, and moving on from there. The classic “Vancian” system in the original edition may not be the best fit for the fiction of your fantasy world. These are alternative fictions, though the mechanics are effectively the same. Some, or all of them, could be present in your world. This is the default system. The spellcaster has a spellbook that describes how to cast a spell. The instructions must be carefully memorized, a process that takes some time. Then the instructions must be followed exactly with intense concentration in order to properly cast the spell. If the caster’s concentration is broken in the slightest, the spell fails. When the spell is cast, or fails, the instructions are forgotten by the caster and must be rememorized. The GM determines the specific requirements of the spellbook. A good rule of thumb is 1 page per spell level of each spell recorded in it. New spells can be recorded in the spellbook, a process which takes a good deal of time as determined by the GM. This could be a day or even a week per level of the spell, depending on complexity. This is a system where mystical characters are written on a special surface, such as a stone, a piece of ivory, or an expensive vellum scroll. Reading these characters out loud releases the spell held within the runes and in the process destroys the material the runes are written on. Transcribing runes is a difficult and time consuming process that taxes the person binding the spell within the runes. The spellcaster must understand the language the rune is written in, be this an ancient long dead language, or a mystical language known only to learned wizards. During a wizard’s research time each day, he may transcribe a number of runes equal to the total of his spell slots listed in his class’s advancement table. The GM will have to rule if the power in the rune lasts for longer than a day, if so it is possible for the wizard to store up runes – and have the potential to cast more spells in a day, which could adversely affect the power balance of the wizard. These are spell points. The spellcaster can cast any spell he knows as long as he has the spell points available. 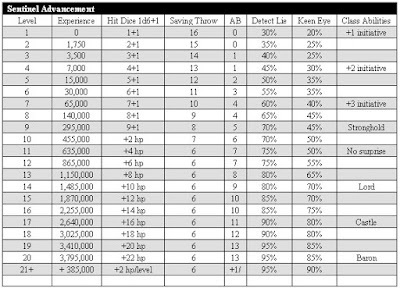 The caster gets an amount of manna equal to the total of his spell level slots listed in his class’s advancement table. Each level of a spell requires 1 manna to cast (a 3rd level spell would cost 3 manna). A caster cannot cast more spells of a particular level than listed in his spell slots. In this system there are no spellbooks required, though a spell may still need verbal, somatic, or material components to cast as described in the spell. The caster creates the effects of a spell using chemicals and other material components. The caster would be limited by the amount of potions, oils, and salves he could carry. Many adventures could involving tracking down these rare components. Slaying monsters could reap rare and precious materials for alchemical concoctions. (for clerics, or possessed wizards) The caster gets his magic from another power, terrestrial, infernal or celestial, and he becomes the channel, or conduit for the immense power of the spell. Terrestrial sources could be the ley lines of the world, or the life force that binds the world together, or the web of magic that is the very fabric of reality. Misusing magic could have grim repercussions for the health of the world. Infernal sources could be an arch-devil or personal demon, casting spells could have far reaching repercussions not only for the caster's soul, but for those who associate with him. Celestial sources could be a god or goddess, spells not used in the best interest of the deity will likely fail. My initial reaction upon seeing only one saving throw type in Swords & Wizardry was "huh?". I couldn't get past the simplicity, it seemed too easy. But then when we test played a session it immediately became clear how elegant only having one saving throw was. Instead of having these discreet, specialized circumstances - it quickly became a measure of will to live, tenacity, and luck - far more common and more useful in a variety of situations! By thinking of it as a very generalized stat, it became much handier in the game. It also became easier to adjudicate circumstances. In original DnD the categories of saving throws were actually very odd. Why was Death Ray or Poison the same? Why would Wands be different from Staves? And then Dragon Breath seemed very specialized, as did Stone saving throws. Luck. Will to live. Tenacity. This is how I see the singular saving throw now, and it has greatly improved our gaming sessions. By simplifying, it has actually given us more gameplay. 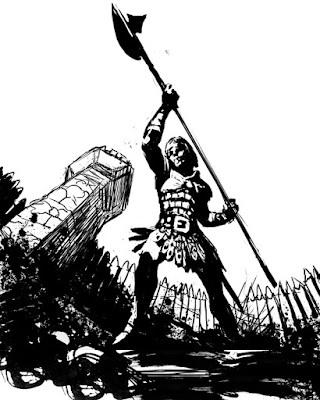 One thing I am considering is borrowing one of the few innovations in 4th edition I do like, that is making the saving throw a bit like an armor class stat, where the opponent has to overcome it, instead of a number that gets lower with advancement that the victim has to overcome. For further reading Jeff's Gaming Blog has an excellent series on saving throws well worth checking out. 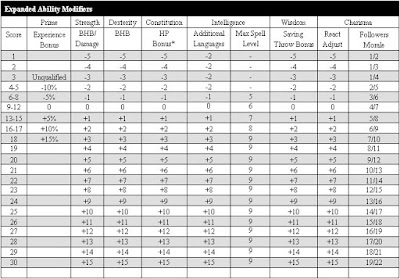 I was comparing the ability modifiers in Swords & Wizardry to that in the Rules Cyclopedia. I think it is interesting the power creep from original edition to the Moldvay edition. Even Swords & Wizardry has it from the "white box" edition to the core rules edition. One of the surprises to me was just how stingy AD&D was between 7 and 14, which S&W white box also is. AD&D modifiers are all over the place, so I just averaged them. Personally I really like the spread in the Moldvay edition, and the Rules Cyclopedia has long been one of my favorite RPG books. I've found myself rereading the Cyclopedia after Swords & Wizardry sucked me back into "old school" gaming. I didn't recall it rambling so much - kind of like the 1st edition DMG except without all the personality of Gygaxian prose. And as it has often been commented, the layout and art are not exactly inspiring. Still, it has a magic quality to it. Probably because it is the only official D&D book ever published that can truly be called "complete". So what was the point of this excercise? I'm not sure I'm sold on the ability adjustments as presented in S&W, they're just a bit too conservative, and I'm thinking of just using the Moldvay edition in that respect. Another reason, when I first got the Deities and Demigods book in high school it was mind-blowingly cool that it expanded the ability stats table up to 25. Yeah, we just looked at that book as the "really high level monster book". Of course this kind of "monty haul" gaming is frowned upon these days, but I don't care what anyone thinks, we were having fun! Isn't that really the point? Demi-God: only Demi-gods may have ability scores 21 or higher. Lesser God: only Lesser God s may have ability scores 24 or higher. Greater God: only Greater Gods may have ability scores 27 or higher. Paragon: 30 is the quintessence of an ability. For example, Thor is the paragon of Strength. There is no one stronger. Boy does James Maliszewski know how to stir the pot! Of the "old school rennaissance" guys, he's one of my favorites. And the fact that the "what is old school?" debate is the topic of the day shows how influential his writing is among this growing community. I wasn't offended in the least by his statement that old school could be objectively defined - I saw it as a gauntlet being thrown down to us to explain what we mean when we say something is, or is not, old school. AD&D burst into my life around 1981. I was in seventh grade, just that age when boys start getting interested in details. I didn't have any experience with original edition, or basic D&D. 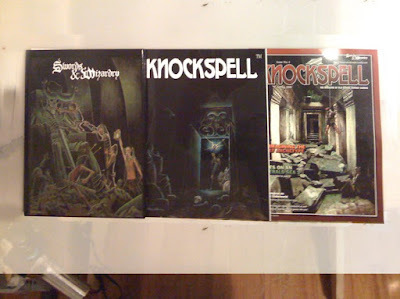 Though I did get copies of Keep on the Borderlands and Isle of Dread (the first adventure I ever ran. Poorly I might add.). 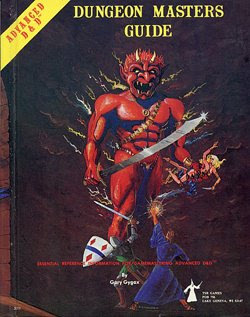 In general we frowned upon basic as being inferior to AD&D. I mean there it was on the cover Advanced, of course it was superior. Little did I know at the time about the intriguing history of D&D. Many years later I eventually acquired a copy of the white box, along with Chainmail, and all the supplements. I got them more out of a collector's mentality than anything. I read them, and as someone who has designed successful games that did well enough to make it worth the time spent on them, I admired the spark of genious that original D&D was. However I never seriously considered playing it until recently. Professionally, I work as an art director in video games. And I work with Andrew Leker of Jorune fame (yeah, old school indeed!). He made an interesting comment about AD&D once. He said there was something special about the original D&D, but that when AD&D came out it was like they were taking themselves way too seriously. Coincidently, it was shortly after that I acquired some old Polyhedron magazines, and read an article by Gary Gygax about AD&D and that the intent was to impose order and uniformity on the D&D community - which had become too diverse. That helped to define "old school" for me. Before AD&D it was like the frontier - the wild west where every gamer was forging what this new hobby was and could be. Then AD&D "civilized" the frontier, so to speak. Of course, it didn't because as teens all we did was argue about what a rule did or didn't mean. The books, contrary to settling the issue, opened up even more. Because it is impossible to define every possible situation. This is where the "old school" mentality really shines, and why Swords & Wizardry does it so elegantly for me. 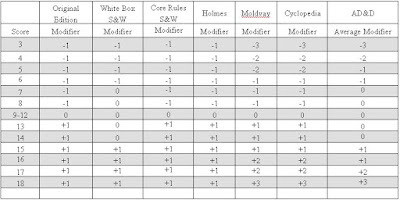 The Referee determines if one side gets a free initiative phase before the first initiative roll. This is either through common sense (adventurers or monsters are not alert), or it can be a range of probability (e.g., a particular ambush has only a 50% chance of succeeding when the victims are alert and watchful). To me this is such a beautiful paragraph. It says so much - yet gives absolute authority to the referee to adapt to the specific situation. We don't have details and complications, or boring charts, just a guideline on how to handle the situation. Now, if surprise is so important to my campaign I can write up my own detailed charts, or look up what others have written about it. I can adapt the rules to my campaign - I don't have to adapt my campaign to the rules. This is the same spirit we see in the original edition white box, and in the classic Holmes and Moldvay editions. There are rules where needed to make it a game, guidelines where rules would just complicate, and the rest is left to the community to develop. This same spirit is alive in all the rennaissance games like Basic Fantasy, Labyrinth Lord, and so on. They all share a quality that can only be properly called "old school". As I get older, my time becomes more precious. I have less time to waste on details, and want to get to the fun. While fun is hard to define (believe me, in video games, I've been involved with so many game designer's discussions on "what is fun?" to know), it is the challenge of trying to define it that makes the debate worth participating in. If you've only been looking at the PDF's, the print editions are oh-so-much-more glorious! The font size, the clean layout, the weight of the books in your hand, it all adds up to a much more satisfying experience. And much easier to read. I've already made quite a bit of progress rereading through the Swords & Wizardry core book, and I'm having some epiphanies about what the grognard's mean by "old-school" gaming. There is something about the looseness and free form nature of the less-than-detailed rules that allow for spontaneity. My mind fills with so much more potential and ideas than a lot of the more "complete" RPG's I've read lately. Looser rules are indeed a big part of the magic that has been lost! It is making me rethink my approach to the sentinel character class. I want to remove the percentage stats for keen eye and detect lie, and allow for the GM to have more freedom in interpreting these things. Because the GM is going to know his players and campaign so much more than this designer could ever anticipate. The release of Swords & Wizardry is good timing for me. Between the releases of DnD 3.0 and 4.0 I, like many, became enamored with the "indy RPG" movement. RPG's with such diverse genres as playing Mormons on the frontier to playing a Cat (though one of my favorites was Secret Lives of Gingerbread Men). Despite the quirkiness that some of them engaged in, there was a lot of compelling work being done. And best of all, the indy RPG's tended to be rules-lite. It was almost like I was being primed for the release of Swords and Wizardry. I feel like our beloved game and hobby is being reclaimed by the fans. I've come to appreciate simplicity, or more importantly, elegance in game design. Einstein would say "Make everything as simple as possible, but not simpler." In middle school there was nothing cooler than consulting tables to see "to hit" numbers. However, getting past my nostalgia I have to admit that the simple "BAB" (base attack bonus) of 3.0 DnD really was an improvement. So I appreciated the "ascending armor class" system in S&W. It was, I think, another good design decision - where the goal to stay true to the original edition didn't stand in the way of something clearly simpler and better. Matthew Finch wasn't afraid to acknowledge that. Okay, so I've invented a bit on the 21+ levels, because the charts don't really go there. I gave what I think is a reasonable interpretation. Since the advancement tables allow for going beyond 21st level. I love orcs! Just as much as anyone. I mean, I illustrated a whole book on orcs (or, orks, as they were called in that case). I also think hobbits are the bees knees. It was seeing Rankin-Bass' "The Hobbit" at the tender age of 8 that propelled me into being a fan of (nearly) all things fantasy. But I want to remove all Tolkienisms from my campaign. Why? Because Tolkein did them so well, and they fit so beautifully in the world of middle-Earth that I just don't like how they've been plucked from that world and thrown into generic fantasy. I want to base my campaign on Mythic Earth. That is to say, real world mythologies, legends, and history. Which I've felt for a long time should have always been the default world setting of D&D. I say this with no intention to malign it's pulp fantasy influences, because I love all things Burroughs, Howard, and Leiber! I would just prefer them to be in their own supplements. They are each like a masterpiece composition, and isolating the parts only mars the works of art they are. 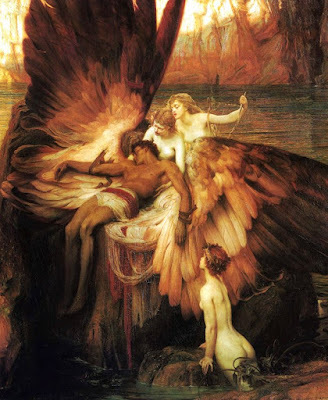 Another reason is that I had a Greek mythology book as a kid, and there were two paintings in it that inspired my desire to become an artist. Beyond the obvious reasons a boy might like these I was always captivated by the stunning beauty and craftsmanship of the art. 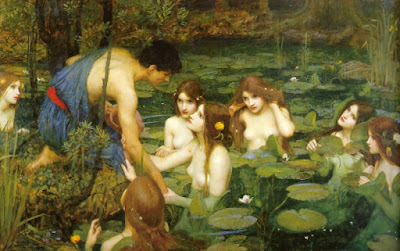 I just didn't understand how you could put oil paint on a canvas and make it look like this (alas, sadly, I still don't). When I say Mythic Earth, this is what I'm talking about. 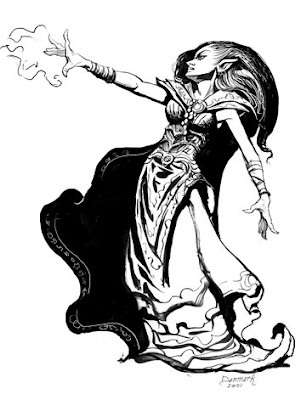 The part of me that admires not just quality, but the highest quality, can only imagine D&D art ever looking like this. There are some great artists working in the field today, but only a few might even approach this level, and their services are likely cost prohibitive. Besides, few publishers are interested in this genre labeled "romantic fantasy" and consider it to be "quaint". Today it's all spiky armor and grimacing faces that look like the characters are suffering a severe bout of constipation. So, I'm saying I want to de-Tolkienize my campaign. That means no orcs, no hobbits, and the dwarves and elves, I mean dwarfs and elfs need a serious revision. I loved all the quirky character classes created in the heyday of Dragon magazine. I have some particular favorites, some of which I hope to convert to S&W eventually. The sentinel was one that I really liked, not because the idea was so great. I mean, he's just a glorified fighter, but the word sentinel is so evocative, it brings up images of a lonely guard standing watch on a tower wall. Vigilant, because he knows the enemy may strike the moment he lets his guard down, and he has the fate of those under his watch at stake. This is my first attempt at a homebrew character class, I apologize for any faults, and I may be doing some unusual things that are growing out of my own campaign that I'm preparing to run for our gaming group. One of these is the way I'm handling "pseudo-skills" with a simple bonus to a d20 roll. Yeah, I know this reeks of the d20 system, but it is the simplest way to manage these kinds of things I know of. 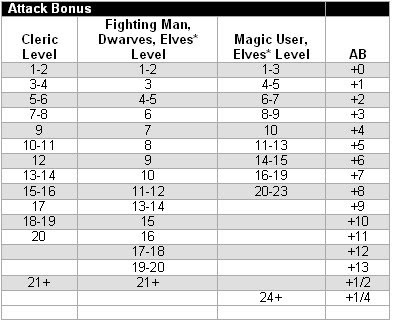 And instead of a combat matrix, just a simple bonus to d20 roll vs armor class is presented as "Attack Bonus". (I will always use the "ascending" AC system). You are a keen observer and stalwart watchman. Whether stationed on the city walls, or on the dangerous fringes of the borderlands, you are loyal to your country and liege, sworn to protect and defend that which has been entrusted to you. Your diligence to stay alert and your sharp eye make you the one to rely on to stay on guard through the night and to notice the slightest details that most overlook. You may not be able to cleave through hordes of enemies like the fighter, or understand the mysteries of faith and magic like the cleric or mage but the party relies on you to defend the weaker members. You insure the spell-casters can concentrate on their spells, and you hold the line in a tough battle. Eventually you may be granted a fort on the borderlands, or a castle in the heart of an important region to defend and protect the peasants and merchants and ensure the preservation of the civilized lands. Alertness: at 1st, 4th, and 7th levels the sentinel gains +1 to all initiatives rolls. At 11th level he is incapable of being surprised. Keen eye: the sentinel notices things others overlook like secret doors, thieves hiding in shadows, and distant movement. Detect lie: the sentinel can often tell when he is being lied to. Establish Stronghold (9th): At ninth level, a sentinel is granted a stronghold and attracts a body of loyal men-at-arms who will swear fealty to him. If he maintains the stronghold well, at 14th level he may gain the title of feudal Lord. If the stronghold is reinforced and built into a castle it will attract villagers, and the sentinel may become a baron at 20th level. Some of the small things that contained stunning bits of wonder and stirrings of the imagination have been lost in later editions of D&D. 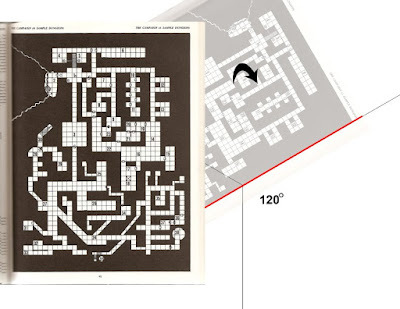 For example in the classic Red Box set, or "Moldvay edition" as it is often referred to, there was a little cross section that described the levels going down in a dungeon. I don't know if the authors were aware of just how powerful this image was. Certainly, later editors didn't because nothing quite like it has been seen in recent editions. 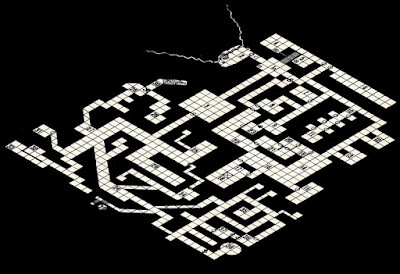 To a kid this map showed the depths dungeons could go to and promised unlimited adventures. 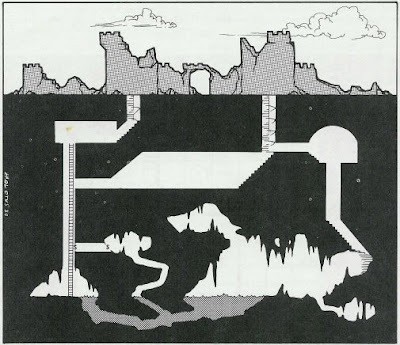 I especially like the contrast of the dungeon sections and the cave like grottos below. I could easily imagine dark things stirring in the murky waters, things best left alone, but that might hold great treasures. I bring this image up because I'm getting ready to add depth to the isometric we did yesterday, and this cross section immediately sprung to mind. It wouldn't even take too much imagination to see how this could be married with the sample dungeon. In 1983 TSR released the Ravenloft module, a product that continues to inspire me. The adventure was revolutionary in its day in that the structure allowed for the module to be played multiple times and the basic story elements could be different each time thanks to a unique fortune telling mechanic. Basically early in the adventure the DM played a forune teller and took a regular pack of cards, shuffled them, and drew cards that when compared to some charts selected the plot elements. 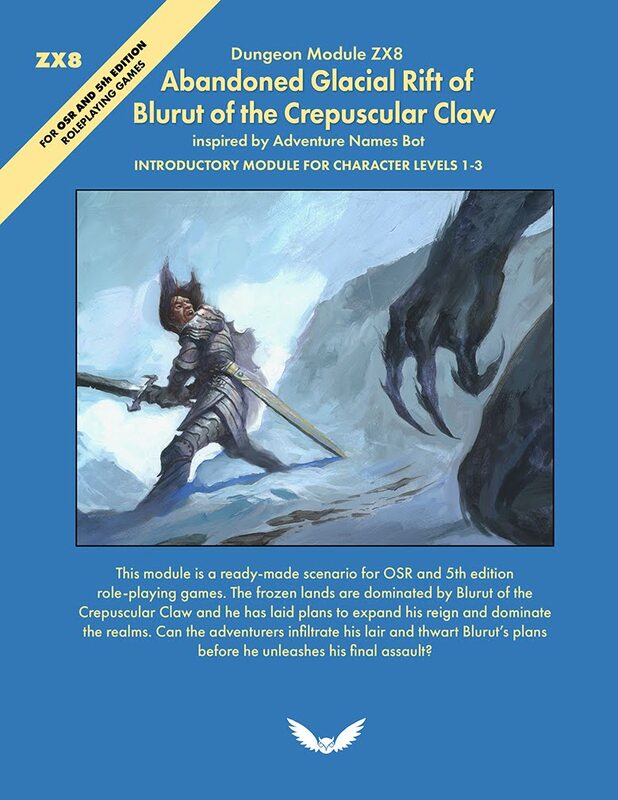 The module itself had some fun encounters, an interesting "boss"monster Strahd von Zarovich the vampire, and it evoked a very spooky goth mood (which in that day wasn't the over-exposed genre it is now). To a young budding artist like me the truly compelling things were it had a great cover, great interior illustrations, and most mind-blowing: "3d" maps. Dave Sutherland really outdid himself in creating an amazing isometric construction of the main encounter area: Strahd's castle. 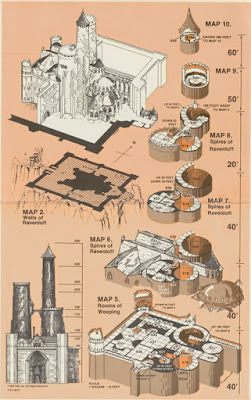 Next to his classic "Paladin in Hell" illustration, I consider these maps his finest work. I would sit for hours reading the module, looking at the maps, and imagining what it would be like to wander those haunted halls. I only ever played the adventure once, much later, and while it was fun - it didn't quite live up to my vivid imaginings. Years later I went on to attend art school, and had some training in perspective, and learned just how easy isometric is to draw in. Especially with modern digital tools, and a little bit of understanding of isometric, it is easier than ever. I thought it would be fun to put our monastery cellars and dungeon into isometric as part of our fleshing out exercise. I'm using photoshop for this, because the transform tool is so user friendly. Though for a clean map I would normally us Illustrator since it creates perfect, hard edged lines with vectors. 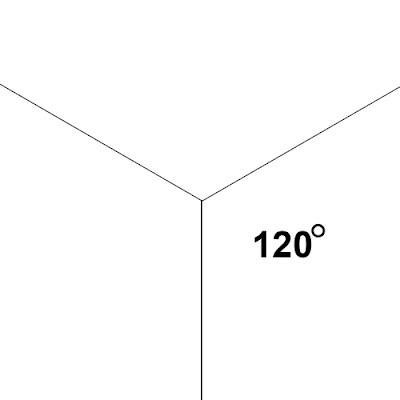 Using the transform tool rotate the map to the right until an edge lines up with your 120 degree grid line. Using the transform tool hold Control down, click and hold on one of the top control points then skew the map to the left, until the top and bottom sides align to your 120 degree grid line. 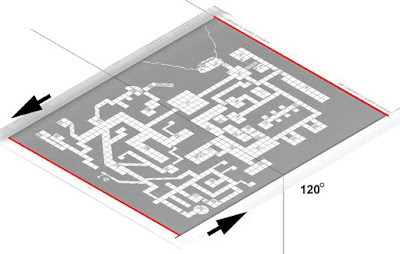 I recently learned that the reason the early maps where done in non-photo blue is because Lorraine Williams, CEO of TSR, believed that the maps where the most valuable thing in the modules and didn't want the fans photocopying them and somehow depriving her of a few bucks. Fine by me. I think this particular color is quite aesthetically pleasing, and certainly makes those classic maps distinctive. Rumors of recent activity in the monastery ruins has been whispered among the town folk. People are saying that servants of a dark god are reawakening the evil once vanquished in the ruins. 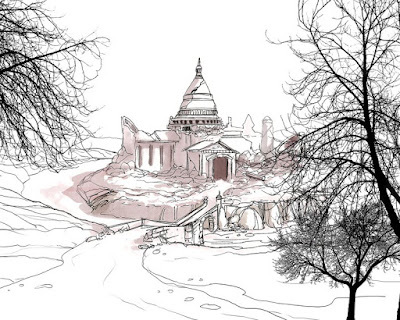 Yet others insists this is a bunch of nonsense, that if anything a harmless order of monks are using the ruins as a place for quiet contemplation. These clerics appear to be of a holy order, but upon closer inspection they wear a grimace and have a dark demeanor that is unsettling. They will pretend to be helpful, but at the first opportunity will attempt to subdue and bind opponents, so that they can be taken into as prisoners. The first step in fleshing out The Sample Dungeon is to give it a sense of place. 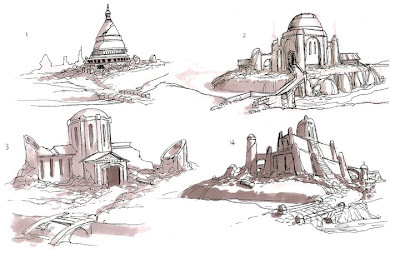 Seeing as it is described as the Monastery Cellars I thought I would start with some concept sketches of monastery ruins, since ruins are the coolest place in the world to set a dungeon. I like to explore a variety of ideas in the early stage, before settling on anything too specific. 2. is a little more typical western looking monastery. 4. I'm not sure where I was going with this hodge-podge, there is a bit of Mayan combined with some western shapes. In each of these I wanted to add a hint of a river, since the map shows an underground stream and I thought it would be a great element for transporting stuff, also a secret watery entrance to the dungeon perhaps? I'm leaning towards further developing #3, but I need to think more about it. In 1982 while sitting in math class the kid who sat in front of me brought in this strange book called the "Dungeon Masters Guide". Since I'd rather draw than do math the art on the cover caught my eye and I asked to look at it. 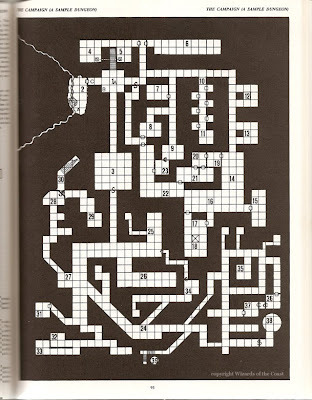 In it was the first dungeon map I ever saw - and it filled my imagination with wonder. The book only had a tantalizing tidbit of info about what was in the dungeon, the best part was that the rest was up to me to fill. I thought it might be a fun exercise to try and flesh it out using the Swords and Wizardry rules. I get tremendous enjoyment out of maps, looking at them, imagining adventuring in the space they evoke, and creating them. 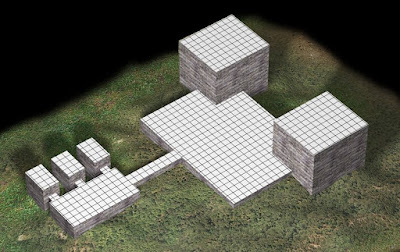 I would like to take old D&D maps and rebuild them using modern tech, in this case 3ds Max. This map is not of anything in particular, it's just a test. I recently got Swords and Wizardry out of curiosity and all I can say is wow. This is a remarkable work. 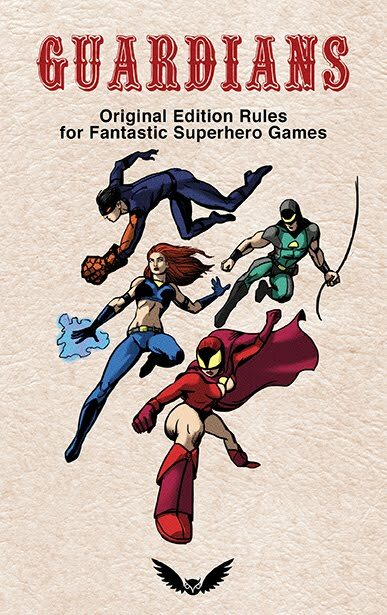 It is a retro-clone of the original Dungeons and Dragons that has been lovingly crafted from the source material utilizing the OGL. What is remarkable is the discipline that designer Michael Finch has displayed. As a game designer myself, I admire the way he refrained from complicating the classic D&D game. It is as true to the source material as possible, while staying within the bounds of the OGL. At the same time it is better laid out, better organized, and written in a more clear, concise tone than the original. And if it isn't close enough to the original for you they've even made a white box edition that really is true to the source, warts and all! I view the creative process as a journey. Your first stab at a design is usually close to the mark, but not quite a bullseye. You have to then explore the design space, often straying from your original design, but if you are a smart designer you often end up back where you started - taking advantage of all you learned on the creative journey you come full circle and can now hit the bullseye. This is precisely what Mythmere Games has done with Swords and Wizardry. By taking advantage of 35 years of playtesting - and not fixing what ain't broken, it is a fitting tribute to the legendary creators Dave Arneson and Gary Gygax. If you look around, you'll see that retro-clone gaming is growing like crazy. New blogs spring up each day. 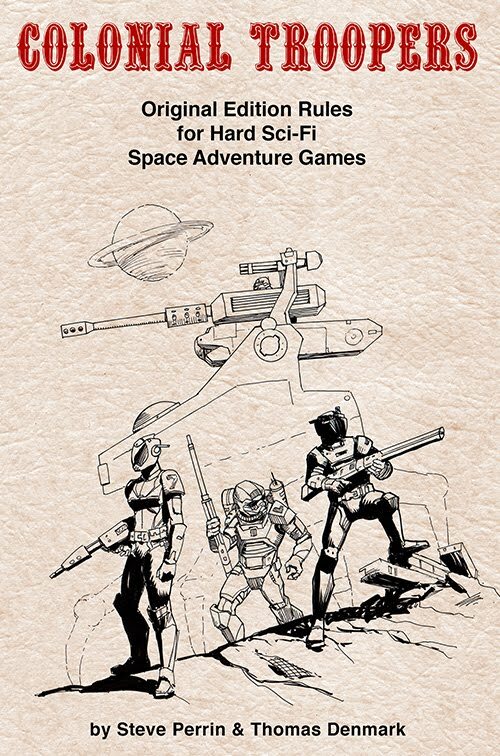 Old grognards are getting back into gaming and posting their own home-brewed rules compatible with the original edition. There is a movement afoot. You can speculate why now, there are many reasons. So why start another retro-clone blog? Because I want to join in on the fun and house-rule the heck out of this game. Who knows? I might come up with a publishible home-brew myself.